The need to plan for and transition to retirement is now a reality for people with intellectual disability, who are entering later life and have been employed. Retirement from paid work has taken on a new meaning across all societies in the context of population aging and increased life expectancy. Much retirement research in the general community focuses on financial planning; however, attention has turned to the psychosocial dimensions of retirement as a key milestone in the life course and one that may impact on an individual’s physical health and psychological well-being as they leave behind the social and economic structure of employment. This chapter examines the situation of people with intellectual disability and what is needed to support them as they plan for, transition to, and live in retirement. 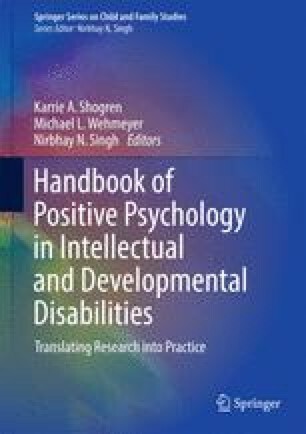 The chapter first draws on mainstream retirement literature before providing an overview of recent research in intellectual disability, mostly from Australia. To provide a focus on research to practice, the chapter concludes with a description of an intervention, Transition to Retirement. This program promotes a gradual transition to an active, socially inclusive retirement lifestyle for older adults with intellectual disability. Retirement by people with intellectual disability is well suited to future positive psychology research, but little such investigation has occurred to date.